In May 1851, the New York City Council passed an ordinance prohibiting burials in Manhattan. Many religious denominations purchased land in Queens, particularly in Middle Village, for cemeteries. In 1852, a Manhattan Lutheran church led by Reverend F. W. Gessenhainer bought several farms, totaling 225 acres, north and south of Metropolitan Avenue, and set them aside for use as a cemetery. Surrounded, as it was, by cemeteries and by Juniper Swamp (which was filled in 1915 and became Juniper Valley Park), the community had little room for growth. By 1902, the population had reached only 1,300. Farms continued to dominate the region through World War I. During the 1920s, a need for housing spurred development: rows of one-family, detached houses were built near Juniper Valley Park and Metropolitan Avenue, which remains the area’s commercial center. Between 1935 and 1938, Parks leased this property from the Gorbess Realty Corporation. In April 1938, the City of New York purchased one parcel of the property for $10,450. A month later, the city acquired the second parcel through condemnation, and Parks assumed jurisdiction over both areas. 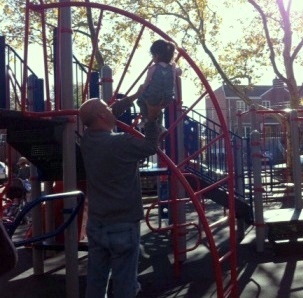 In July 1994, Middle Village Playground received a $294,000 reconstruction sponsored by Mayor Giuliani. 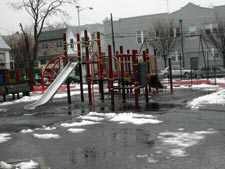 The playground now features two handball courts, two basketball half-courts, a boccie court, swings, modular play equipment, benches, a water fountain, and a spray shower.